Pines, spruces, and firs are commonly planted in Indiana landscapes individually or in groups to create green borders that mark property lines or protect homes from the wind. When stressed by adverse environmental conditions these trees can be attacked and killed by a variety of insects that bore into trunks and stems. Injury from borers can be reduced by helping trees protect themselves, recognizing and managing early signs of borer injury, and sanitation - the removal of borer infested trees from the landscape. As a group, borers are most successful when they attack a tree that is stressed due to lack of water or that is planted under too much shade. When a borer attacks a vigorously growing conifer (like pine), the tree can physically pitch the borer out of the trunk in a flow of sap. Under full sun conditions, healthy trees have enough energy reserves to produce poisons that can kill many of the infectious diseases that can be spread by borers. Trees that are planted properly in the correct location and provided water during drought are most capable of defending themselves. 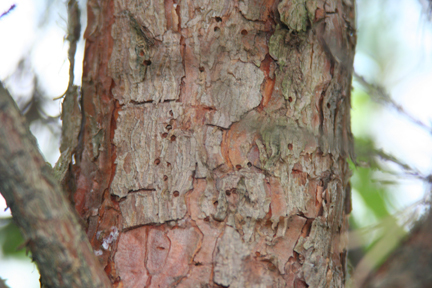 Borers that feed in the trunk produce a random pattern of holes in the bark (Figure 1). They can be distinguished from those produced by feeding woodpeckers and sapsuckers which make holes in a straight line (Figure 2). 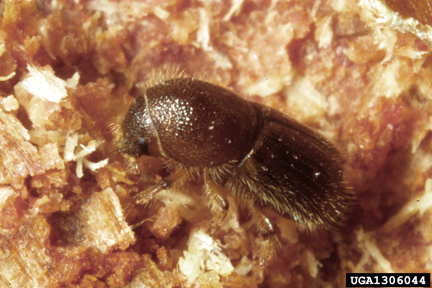 Bark beetles (Figure 3) are among the more common boring insects detected in declining evergreens and spruce in urban and rural areas. 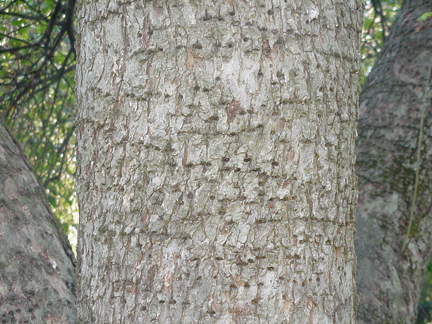 Symptoms include holes as thick as a pencil lead along the main trunk and major limbs. Although there are many bark beetles in our region, their life cycles are similar. Once beneath the bark, adults lay eggs that hatch into small grubs that bore beneath the bark. Grubs eventually hatch into adults that re-infest the declining tree. Often, more than 100 beetles per square foot of bark can emerge from declining trees, carrying a blue-stain fungus that attacks the plant vascular system. This fungus can be passed to new trees when they are attacked by the adult bark beetles. Bark beetles on evergreens have several generations of adults that fly from mid April through mid September. These beetles can be controlled through sanitation activities in the winter and applications of insecticides to the tree trunk during the adult flight period. Pine sawyer beetles (Figure 4) are often reported on white and Scotch pine. Infested trees have holes about 3/8” wide that produce a tremendous amount of finely shredded wood shavings and brown grainy excrement. 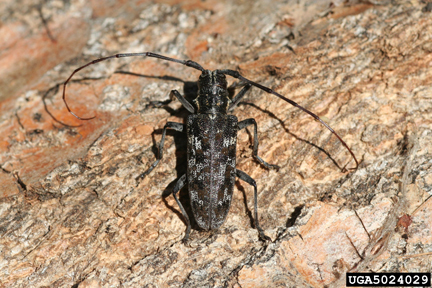 Peeling back the bark of affected trees during the spring and fall reveals 3/4” long white round-headed borers with strong brown mandibles. In July, it is actually possible to hear the grubs chewing beneath the bark. The first beetles that attack these trees can carry a roundworm called the "pine wilt nematode" which can clog the tree's circulatory system so fast that their needles yellow and wilt before they turn brown. As with bark beetles and blue-stain fungi, healthy plants are better able to withstand some attacks. Pine sawyer beetles winter as larvae and emerge as adults from mid-May through August. Zimmerman pine moths (Figure 5) are common pests of Austrian and Scotch pines and Norway spruce that can kill tree limbs and tree tops. They are usually found boring into the trunks of trees near where the branches meet the main stem. Unlike the previously mentioned pests, these insects cause the tree to produce a large amount of gummy sap and sawdust pellets that are most apparent from late June through early August. Adults emerge from trees from late July through August and lay eggs in cracks and crevices in the bark. Young caterpillars feed on bits of bark and pine gum until they dig shallow pits, where they spend the winter. When the weather warms in early April, the caterpillar crawls out of its resting place along the exposed bark surface to where the branches join the central trunk. Once there, it bores beneath the bark and produces gummy wounds, sometimes girdling or killing limbs or tree tops. These caterpillars can be controlled through sanitation activities prior to late July and with applications of insecticides to the tree trunk during early April to kill caterpillars as they crawl from overwintering sites to bore into the trees. 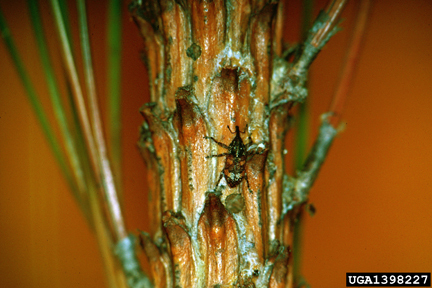 White pine weevils (Figure 6) are common pests of pines, Douglas-fir, and spruces. Like trees infested with Zimmerman pine moths, the central leader and lateral branches can be curled into a shape that resembles a shepherd’s crook. The top two to three years of growth can be affected. 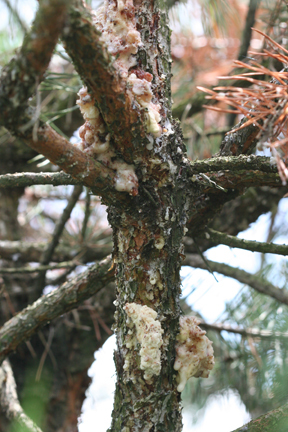 This pest can be distinguished from Zimmerman pine moth by lack of gummy sap and the presence of a tunnel in the central shoot or small round exit holes on the side. Lateral branches from the infested tree’s first whorl may also be curled (Figure 7). In late March or early April, adult females (Figure 7) lay eggs in twigs, leaving behind a glistening drop of sap. In early summer, legless (1/4”) white c-shaped grubs can be found in stems, beneath the bark surface. By late June and through July, larvae form chip-bark cocoons inside the base of injured stems. Adults winter in leaf litter and fly to tree tops to mate when the weather warms in the spring. Females lay many eggs in terminals, hatching into grubs that bore into shoots. Legless larvae continue to feed through July, when they pupate in chip bark cocoons inside the twig. Adults emerge in August and chew on twigs before overwintering in the leaf litter. These weevils can be controlled, in June and July, by removing and destroying curled branches that contain the weevils. Applications of borer insecticides to the tree leaders or imidacloprid to the soil can be effective in early spring to kill adults attempting to lay eggs. 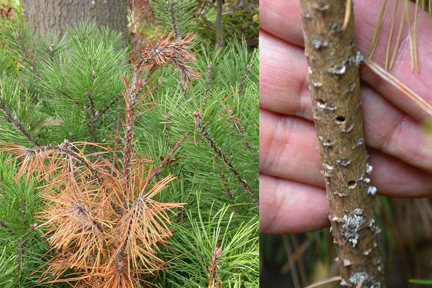 Weevil pests that breed in dead or dying pine can stunt or kill neighboring healthy pine trees. These include the pales weevil, northern pine weevil, and pine root collar weevil. Pales and northern pine weevil can also attack pine seedlings that are planted next to dead stumps to replace recently killed pines. Management of these pests requires treating dead stumps with insecticides or waiting two years to replant next to stumps. The pales and northern pine weevils are two closely related beetles that chew on twigs in the fall and spring, causing twigs to ooze sap and turn brown in early summer. Adults are black snout-weevils, and the pales weevil (Figure 8) is about 1/2” long with small gold spots, while the Northern pine weevil is somewhat smaller, with white patches on the end of its hind wings (Figure 6). Larvae of both species are white and legless. Adults are attracted to cut pine and mate on pine stumps when the weather warms in spring. Females burrow to roots of cut stumps to lay eggs. Larvae feed on these roots until they pupate in chip bark cocoons and emerge adults in September. During the summer, adults spend days in leaf litter and nights feeding on twigs. Adults live for two years and lay eggs during both summers. Applying insecticides to the twigs in early September and April can kill adults attempting to girdle twigs. 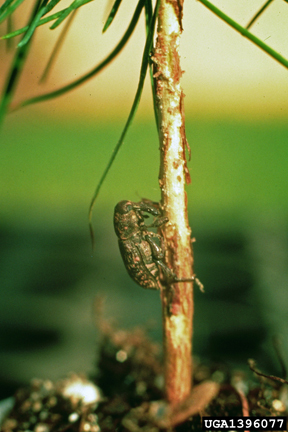 Pine root collar weevil (Figure 9) is less common in the landscape, but can readily kill trees. Adults feed on the bark near the soil surface and their young feed on root and root collar. Injured plants produce large amounts of darkened sap at or near feeding sites that are clearly visible at the soil line. 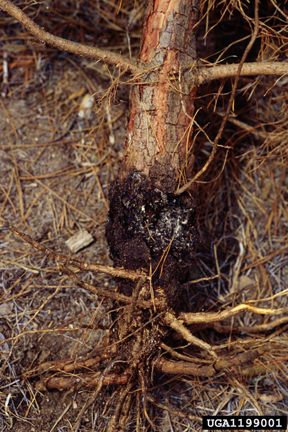 Partially girdled plants become weak and are subject to bark beetle attack, while completely girdled plants die and turn brown. Adults are black snout-weevils, and the larvae are white and legless. Adults live for two years and lay eggs both summers. Each year they chew into bark of live trees and lay eggs in injured sites from May to September. Eggs laid in spring become pupae or adults by September. Eggs laid in summer will winter as larvae and become pupae the following July. Larvae feed on root and are present all months of the year. Removing and destroying infested trees help protect neighboring trees that are still healthy. Burning, or chipping and burying the trees with borers inside, will kill the borers before they become adults and can walk, crawl, or fly to nearby healthy trees. Sanitation is most effective between Oct. 1 and April 1, when most of the borers are spending the winter inside trees. These dying trees also act as traps that lure local borers away from healthy trees to breed inside them. Sanitation efforts should be focused on evergreens that have at least half of their branches containing completely brown needles. Trees that have declined to this state will not recover and will soon die. Destroying these trees before April 1 will kill the borers before they leave to attack healthy trees. Three insecticides are most commonly available for home landscape use. These include permethrin (e.g., Hi-Yield 38 plus), bifenthrin (e.g., Onyx), and carbaryl (e.g., Sevin XLR). Susceptible parts of trees should be coated with these insecticides so that the insect is poisoned while chewing holes to either enter or exit the tree. Although other insecticides like imidacloprid (Bayer Tree and Shrub) can be applied to the soil to kill boring beetles, these materials are not likely to be effective on dying trees which are unable to take up material from the soil. Soil insecticides applied in fall and early spring might be helpful for protecting apparently healthy evergreens that remain in a planting after dead trees have been removed. Christmas Tree Pest Manual, Michigan State University https://www.na.fs.fed.us/pubs/2014/Christmas-Tree-Pest-Manual-3rd-EditionlowRes.pdf. Photos other than those taken by the author were provided from http://www.forestryimages.org.